The cast of the new season of Dancing with the Stars was announced recently and you'll be forgiven for not having a clue who the British component is amongst the mix. Katherine Jenkins certainly fulfills the pretty face quota but she hasn't been seen much on US screens. The 31-year-old Opera singer from Wales has sold in excess of seven million albums since launching her career in 2004. Impressive stats, but let's hope she can wow the American audience with her personality too - after all, dancing ability aside, the title that most contestants seem to be aiming for each season is fan favourite. I hope Estelle's got a good supply of flats in her wardrobe. The London singer has been all over American tv and radio lately, promoting her new album 'All of Me'. From performances on the David Letterman show to gigs in New York and interviews with Wendy Williams she's been a very busy bee. The album features collaborations with Chris Brown, Trey Songz, Rick Ross, Nas, Ne-Yo and Janelle Monae. Hopefully she'll have enough time to promote it before flying back to London to be a judge on the UK X-Factor. Although it hasn't been confirmed, she's a hot favourite for the role and she seemed 'well up for it' when speaking to Wendy Willams earlier this week. 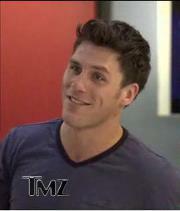 If you watch the celebrity news/gossip show TMZ you must have seen him. Popping up every now and then with a smart comment and a wise crack about Americans. Cork native, Peter O’Riordan, is making a name for himself staking out Hollywood celebrities and he admits the show's producers were 'taking a chance' when they hired him as a reporter. Let's hope he sticks around as I'm not quite sure Harvey Levin 'gets him'!